Many laws affecting Aboriginal Peoples were combined in 1876 to become the Indian Act. The Act gave Canada a coordinated approach to Indian policy rather than the pre-Confederation piece-meal approach. 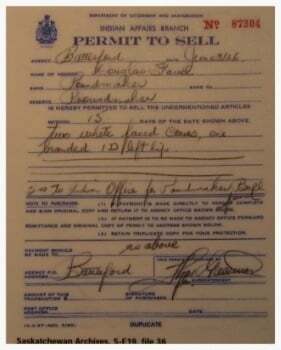 Here is a permission slip that would have be required to leave the reserve. Although specifically not a law or regulation under the Indian Act, the Indian Act gave power to the federal government and its representatives, like the Indian Agent, to implement and enforce policies such as needing a pass to leave the reserve. It certainly is something that not many people would have known about the Indian Act. 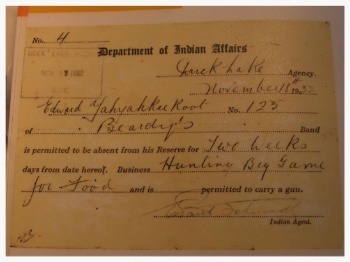 The Indian agent, acting under the authority of the Indian Act, played a key role in the distribution of land, replacing traditional names for "easier" identification and altering traditional and hereditary forms of government, among other actions and restrictions. The Indian Act has been a lightning rod for criticism and controversy over the years, widely attacked by First Nations people and communities for its regressive and paternalistic excesses. For example, Indians living on reserves don’t own the land they live on; assets on reserve are not subject to seizure under legal process making it extremely difficult to borrow money to purchase assets; and, matrimonial property laws don’t apply to assets on reserve. On the other hand, it has also been widely attacked by non-Aboriginal Peoples and politicians as being too paternalistic and creating an unjust system with excessive costs that are considered uneconomical. Here are some of the restrictions and impacts imposed on First Nations (some have since been removed in revisions of the Act). is a piece of legislation created under the British rule for the purpose of subjugating one race - Aboriginal people. Major amendments were made to the Act in 1951 and 1985. In the 1951 amendments, the banning of dances and ceremonies, and the pursuit of claims against the government were removed. In the 1985, Bill C-31C-31 was introduced. For more on this Bill, please see: "Indian Act and Women's Status - Discrimination via Bill C31 and Bill C3". The Indian Act imposed great personal and cultural tragedy on First Nations, many of which continue to affect communities, families and individuals today. CHAP. 18. - An Act to amend and consolidate the laws respecting Indians. The above article has drawn so many readers (240,000+) since it was first published, Bob decided to write a book based on the article. The book was a national bestseller within the first week of its publication. Click the book cover image to read some reviews and/or order your copy.